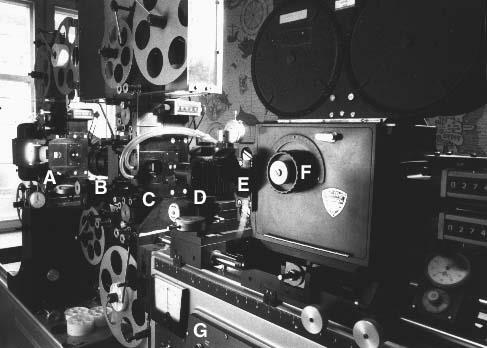 In 1963, Toho company filming its Sci-Fi movie titled ‘Matango’ purchased an Oxberry’s optical printer 1900 series to meet the requirement of SFX scenes with high quality. However Tsuburaya, the SFX director of this movie wasn’t satisfied with the performance of the “three-head” optical printer. After that Tsuburaya met Oxberry’s “four-head” optical printer 1200 series in the U.S. Oxberry had only two of this product back then. The first one had been already reserved by a company in former East Germany, and another one was about to be contracted. Tsuburaya got so much obsessed with this machine’s excellent performance that he made a purchasing contract of the last one on the spot. At that time Tsuburaya production was supposed to make Sci-Fi drama named “WOO” in Fuji Television, and Tsuburaya was planning to allocate the profit for the fund for purchase, as much as $110,000US. However the project of “WOO” was canceled at the last minute. Tsuburaya was at a loss for his cash schedule. He consulted his oldest son Hajime Tsuburaya, a producer of TBS (Tokyo Broadcasting Station). Thanks to the son’s influence on TBS, this broadcasting station promised to cover the purchase cost on the condition that Tsuburaya should make Sci-Fi drama for TBS. Accepting the condition, Tsuburaya planned unprecedented Sci-Fi drama based on “WOO”, and then started filming of “Ultra Q”, which marked a start of Ultraman series.